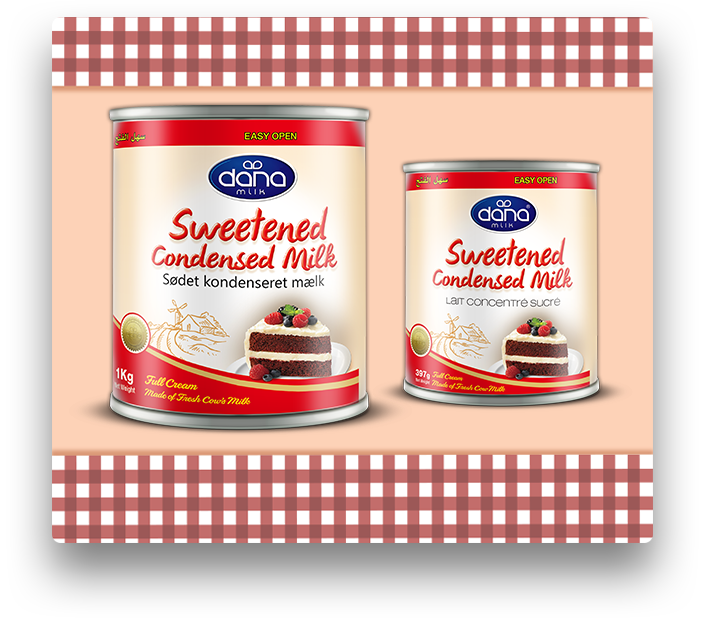 Our Sweetened Condensed Milk is produced from fresh cow milk. We remove over half the water content of fresh milk through a heating process and then blend in the right amount of sugar creating a rich, tick, and smooth mixture. The product is then sealed and preserved in tin cans of various sizes for a long lasting shelf-life. 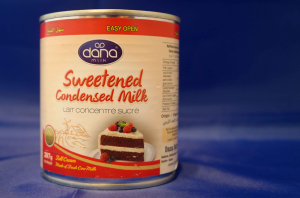 DANA’s Sweetened Condensed Milk is produced using fresh cow milk as always. In our full cream animal fat version, 100% of the natural cow milk fat content remains with the milk that is used to produce the product. We use a special heating process to remove over half of the water content of the milk. We then mix in the right amount of sugar to create a rich and smooth mixture you know as sweetened condensed milk. The product is then packed in tins of 1kg and 400gr sizes for a long life milk item on your shelves. Our fat-filled Sweetened Condensed Milk is also made from pure and fresh cow milk as an ingredient. Firstly, almost all of the fat content of the milk is removed. Also, over half of the water content of the milk is removed through a heating process. Then the right amount of vegetable fat is added to compensate for the removed animal fat. 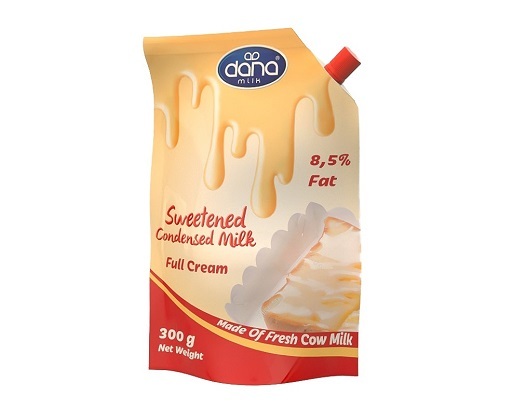 At the and the right amount of sugar is added to create the smooth and rich texture mix of Dana’s fat-filled sweetened condensed milk. As our original full cream natural animal fat sweetened condensed milk, our fat-filled SCM is a great product for home and industrial use. The vegetable fat replacing cow’s natural fat will make the product suitable for many health and diet concerned individuals or products. 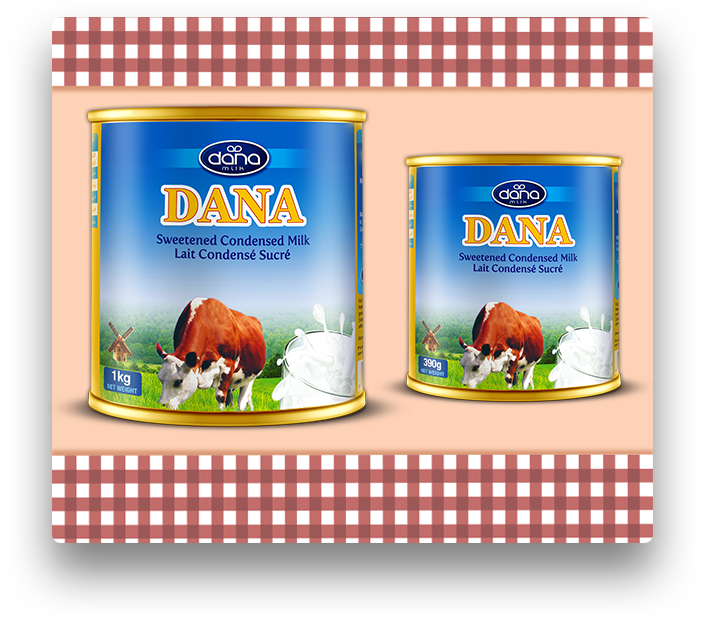 DANA Full Cream Sweetened Condensed Milk is made with fresh cow milk and carries the natural animal fat content of the milk. 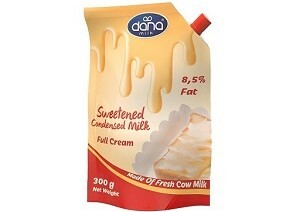 DANA Fat-Filled Sweetened Condensed Milk is made with fresh skimmed cow milk. We remove the animal fat and replace it with vegetable fat. Our sweetened condensed milk – fat-filled or full cream – can be used in confectionary, chocolate, and in the food industry wherever milk is needed. DANA SCM is also a great additive for tea and coffee. Also, mixed with cold water, the product will create a refreshing beverage to quench your thirst. Preserved and sealed in tin cans or pouches, our sweetened condensed milk has a long lasting shelf life and will bring a valuable additional shelf item to your marketplace under a name you know and you are proud of. This video displays a mom and kids family fun over weekend. Trying to cook some easy recipe fruit and sweetened condensed milk cake with the help of children. It is funny and fun to watch. We also produce unsweetened condensed milk. 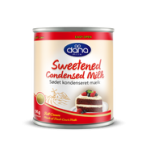 Of course, there are many applications for DANA’s sweetened condensed milk. From mum’s made chocolate chip cookies to bakeries and chocolatiers that are making wonderful tasting stuff. They all make fine use of our products. In addition, here is a fun way one of our customers managed to use our SCM. We know coffee and milk are two food ingreditest that go together well. There are many ways to combine coffee and cream. There are sophisticated ways and there are also simple but fun ways. Our friends in Belize have found a wonderful way to make frappuccino with Belize Best coffee and DANA sweetened condensed milk. And, it seems everyone is loving their coffee. Watch for yourself and have fun.